I hate holiday shopping. That is, I hate holiday shopping in-store. I get super overwhelmed, it’s way too crowded, and it’s hard to know if you’re really getting the best deal on gifts. That’s why I’m a religious online shopper… year round, actually. Believe it or not, you can save hundreds of dollars when you know the right online shopping tips— and it won’t take hours of clipping coupons, either! Read on to discover my best online shopping tips to save money and time this holiday season. While most people try to avoid ending up on email lists, it’s one of the top ways I save tons of money when shopping online. Whether it be exclusive coupon codes, flash sales, or free shipping, you’ll be kept in the know and be notified first about how to save. Often, you’ll even get an instant coupon just for signing up for a brand or store newsletter! Getting cash back is basically getting a discount after your purchase. I use Ebates and earn anywhere between 2-30% cash back from all of my favorite stores. They work with thousands of brands and retailers that you’re probably already shopping at, and you can download a browser plugin that will notify you when you’re on a site eligible for cash back. There’s no minimum for cashing out, it works even when you’re using coupons or shopping sales, and I’ve gotten over $300 back since signing up! Plus, when you first join, you get a $10 gift card to a retailer of your choice! Check out which stores you can get cash back from here. There are so many coupon code websites out there, but actually finding valid codes can be like searching for a needle in a haystack. That’s why the Honey plugin is the best online couponing tool ever. Add it to your browser, and click the button when you’re checking out at any online store. It will automatically start applying any coupon codes floating around on the internet for you, using the best one to get you the most money off! When shopping for clothes, stop trying to guess your size! Numerical sizes can be subjective and vary brand to brand. Make the time (and spend the $5 on a tape measure) to actually take your body measurements. Once you know your bust, waist, and hips, you’ll be able to tell if a piece will really fit you based on a retailer’s sizing chart. This will save you time and money spent on returning items that don’t fit. Supply and demand goes strong during the holidays. Starting your holiday shopping as early as possible will not only give you time to browse and compare products, but you won’t get caught up paying a higher price later on just because you have no time left to shop around. Joining Amazon Prime was probably one of the best decisions I wish I made earlier. Amazon is an awesome place in general to get the best prices on high-ticket items like electronics, and the free 2-day shipping comes in very handy when you’re racing against the clock (or just need some instant gratification!). Plus, it’s so much more than free shipping. You get instant video streaming for a ton of movies and TV shows, and my personal favorite: Prime Music… which I actually like better than Spotify! Prime members also get early access to Amazon Lightning Deals, which can really make a difference on high-demand products. You can always activate the free 30-day trial as you’re starting your shopping and cancel anytime. After that, it’s only $10.99/mo— a steal considering how much you’re actually getting. Here’s one that works on many websites, but you won’t know until you try it: sign into an online store and start shopping by putting things in your cart. Then, close out the window. Don’t complete the purchase. Many stores keep track of this behavior and send out coupons to customers who don’t finish a purchase just to get you to come back immediately. You might have to wait up to a day to get the email, and only some stores have started doing this, but it’s worth a shot! Note: this will only work if you are signed in, so they know who you are and where to send the email. Sites are sneaky, and most of them are keeping track of what you’re searching for on their site and even how many times you’ve viewed a particular item. Have you ever gone back to a product after visiting a few hours before, only to find it now more expensive? They know you’re ready to purchase since you’ve been browsing for a while. Take their power away by shopping on your browser’s “Private Mode,” which keeps them from tracking (and taking advantage of) your shopping activity. Don’t be afraid to take advantage of a store’s price match guarantee. Don’t assume just because they offer it that you’re getting the best price. To take advantage of a price match guarantee online, you may have to call the store’s customer service phone number or use their online chat function. Keep the URL to the cheaper price handy, since they’ll need proof to lower their price. You might be asking: Why wouldn’t you just order online from the cheaper retailer? Perhaps you trust one store over the other in terms of refund policies or customer service if something goes wrong. Or, you can do an in-store pick up to receive the product quicker. Finally, make sure you’re signed up for a brand or store’s rewards programs. Racking up points can equal money off in the long run. Programs like Ulta Beauty’s Ultamate Rewards Program, Nordstrom Rewards, or JCPenney Rewards actually offer dollar-off coupons after earning a certain amount of points, saving you a lot of money when used together with these other tips! 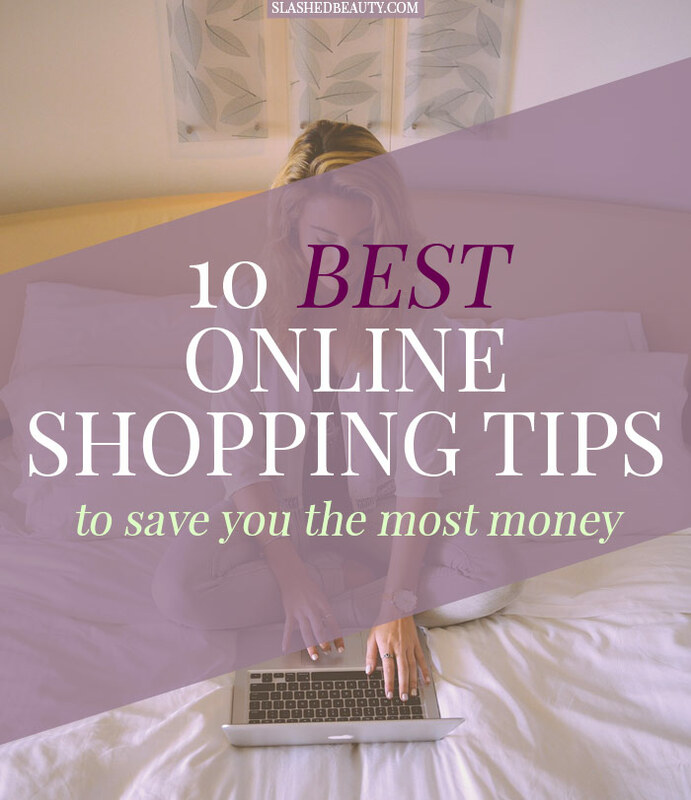 What are your best online shopping tips? Keep in mind, if you shop in private mode, Ebates might not track (Ebates, not eBates). And if you have Honey and try to activate that after clicking through Ebates, it may negate your Ebates cash back. Just some tips!